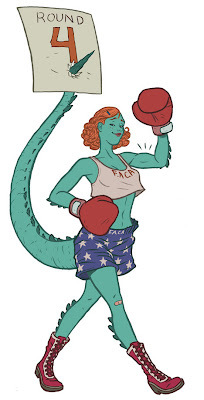 Joe Quinones' interweb-log: Round 4: Fight! Above is the 'arena girl' I did for the superfun Fist-a-cuffs site. I call 'er 'Stellasaurus.' Voting is currently under way for the "West-Division Championship Match" ending tomorrow. So head on over, and may the best fighter win!